For a moment we’re above the clouds, or perhaps, between layers. I watch Lisa down climb steep snow off the top of the Grand, carefully plunging her ax and kicking steps. Her orange helmet sets off the milky sky and black rock. Hot air has risen from the valley 7000′ below, and towering clouds are building. Yesterday’s bitter cold is gone. Mid-June in the Tetons. her cautious steps and meter myself. I join her at the rappel station. “You’re so careful,” I say as I hand her both ends of the rope. “I still want to be climbing and skiing when I’m 60,” she says, threading the ends through the rappel biners. Lisa and I met when we were 12 in Vermont. She taught me how to ski in the woods and how to cause trouble. At Colorado College, we climbed our first grade IV rock routes in the Sawtooths on a Ritt Kellogg Grant, took time off to ski bum in Utah, and read each other’s fiction writing theses. Now, we ski patrol at separate mountains, four hours apart – me near Bozeman and Lisa in Jackson. Two nights ago I drove down on a whim, arriving in Jackson at five p.m. We sipped red wine as we racked up, and were on our way by nine. 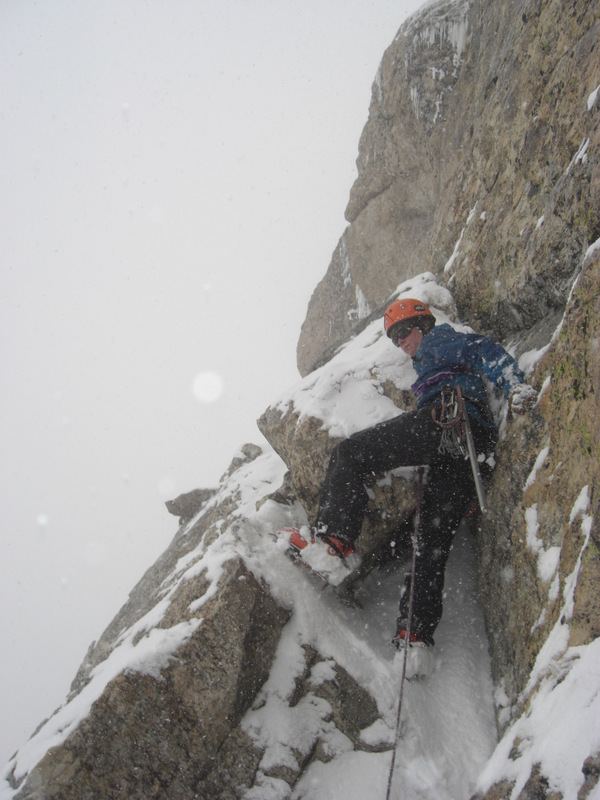 I start the rappel on the Owen-Spaulding, and my crampons scrape like fingernails over the dark, swirling gneiss. Eventually the rap becomes free hanging, and I grip the thin rope as it runs quickly through my device. We pull and coil the rope, then walk over to our stash of skis and packs in the Upper Saddle. We trade gear, then stuff packs and throw them on. With a wet rope stuffed below sneakers, ice ax, crampons, climbing gear and extra layers, my pack feels like 35 pounds of dead weight. I swallow, and my throat is dry and gooey. She cuts to wind lip on the left side, sliding and schmearing down the edge, then skis the steady turns of a mountaineer through isothermic mush. She hoots, and I cut the right side. The top foot of new snow oozes, slowly picking up speed. I traverse back to the wind lip and watch my sluff launch over the edge. An echo rumbles up from below. I move down, nearly stopping between each turn. The watery slush grabs my bases, bending my knees all the wrong directions. I am top heavy. Below the new snow though, is a strong summer base of hard snow, supportive and rock solid.